An important step in planning One’s wedding is getting the right ring. The majority of rings available are mass produced or look that way: “fine jewelry” is considered “classic” in the jewelry industry. A very simple design: a basic shank with a stone on top. If you look, you will find a few variations on the theme, perhaps a little scroll work is added to the head (that which holds the stone in place); but when looking for something unique, it really is difficult to find a ring that is a one-of-a-kind piece unless you have someone make it for you “custom”. Even then when presented with options, a jeweler is procuring a shank, head and stone from a catalog and assembling it for you. I was asked to create a custom ring for a Bride, however she wanted something both unique and simple in design. Quite a challenge because of the vast number of designs out there. After much discussion, renderings were created and rejected, until finally the lady decided on a concept: a very simple wave cresting over the finger: minimalist, no fancy head, no prongs. She wanted it to look like the surf had caught a stone in it crest. 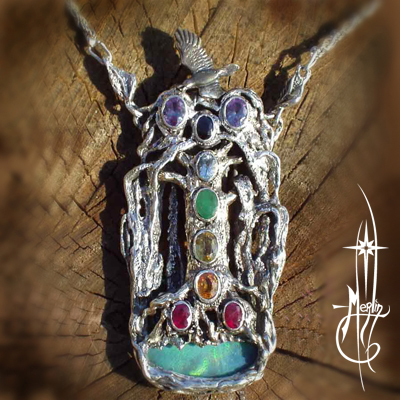 The design was approved and I then carved the piece making the setting a combination of channel and bezel. 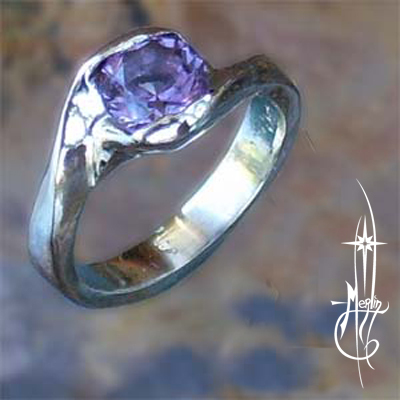 The white gold architecture is minimal allowing the amethyst to be seen easily in full view in parts, buried in the gold in others as a wave would crash around the stone. If you would like a custom, one-of-a-kind wedding ring, please visit my how to order custom page. something that would be uniquely their own. they were looking for someone who could create rings they designed themselves. setting and stone” from a catalog. They were refereed to me by a good friend for whom I had created several pieces in the past. until we struck on a combination between what they wanted and what was physically possible. with a diamond between them. thus preserving the images of the deer over time. to protect the surface and stetting damage of direct blows to the ring. The over all feel was to be medieval, strong and enduring. 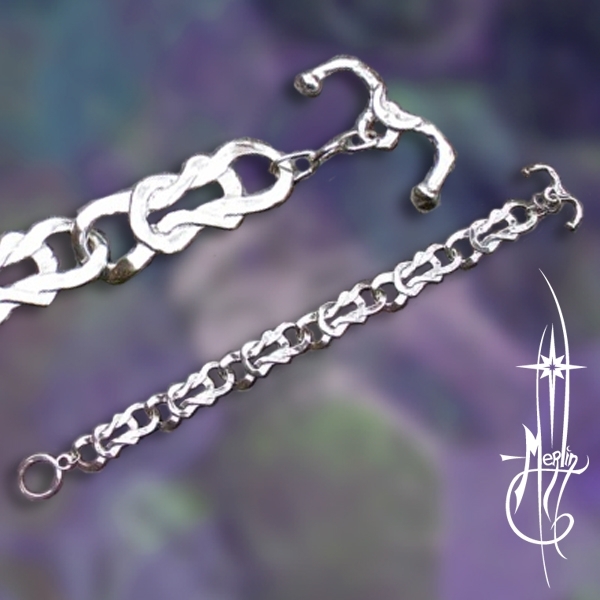 The shanks were to be heavy and in sterling silver with a touch of gold. the gold banding is raised off the finger. The sketches were to be “as close to the sketches as possible” and still look recognizable as deer. I carved the rings by hand and cast the main shanks in sterling. Gold banding was cast separately for the man’s ring while the woman’s ring was adorned with gold wire. The settings are of white gold. All assembled with diamonds and blue zircons. created by hand from start to finish. The progress of the ring’s creation is illustrated in my Gallery Page for the rings and may be found here. please visit my “How to order custom” page. Many of you may recall my Handfasting Bracelet: the design based on the shape of the Mariner’s Knot combining two separate strands of rope of cord to create a knot stronger than the sum of its parts. 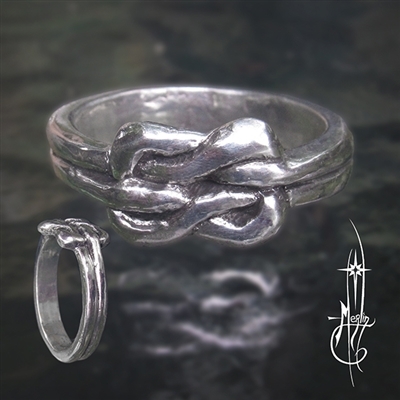 This design was based on a ring I developed many years ago that I have called the Traditional Lover’s Knot Ring. 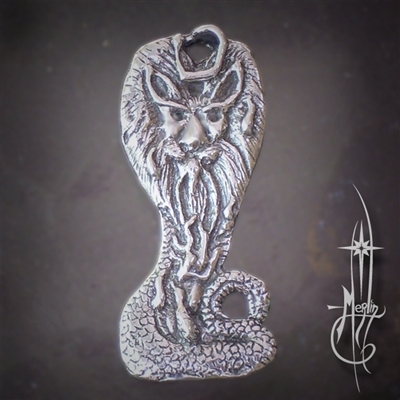 Many have purchased this lover’s knot for Handfastings, Weddings or a simple “promise” ring of love and devotion. In the creating of this design you will note that the knot appears as two separate strands on the tome yet behind the ring (the shank) one may note that it is indeed a single strand. Because of the desire of theme and variation, I have also created a “Celtic” version, by creating a twist of the knot, perhaps representing the twists and turns of the lives shared through one’s life. If you wish I can also add an inscription to the inside of the ring to make it more personal, just as I also create the rings at any size needed, even for those who find rings difficult to find because of ones unusual size: each ring is treated with care and consideration: each ring made specially one at a time.